Being healthy goes beyond consuming less junk food and getting more exercise. It involves getting more nutrients out of every bite you take, and adopting practices that will contribute to a healthy body and a healthy planet. Choosing organic foods can help you feel better and help preserve the environment at the same time. Did you know that according to prevention.com, over 600 chemicals are registered for agricultural use in America today? That equates to about 16 pounds of pesticides consumed per person annually! What’s more, the National Academy of Sciences reports that 90% of the chemicals put into our food haven’t been tested for long-term health effects. Eating organic foods helps avoid ingesting many of these potentially harmful chemicals. Besides avoiding pesticides and chemicals, you’ll get more nutrients out of organic food, especially when it comes to fruits, vegetables and grains. Because organic farms use richer, untreated soil, you naturally end up with food that’s chock full of vitamins, minerals and enzymes. In fact, according to a study conducted by the Journal of Alternative and Complementary Medicine, organically grown foods have 21% more iron, 27% more vitamin C and 29% more magnesium than their non-organic counterparts. What goes along with more nutrients? Better taste, of course. When you go organic, you’ll notice that all your favorite fruits and vegetables like strawberries, blueberries, lettuce, spinach, carrots, potatoes, and cabbage, all taste better and fresher. You’ll enjoy your meals even more when they taste great and you know that they are healthier for you. Every year, billions of American tax dollars are used to sustain big commercial farms. Buying organic produce allows us to support local farmers, strengthen local economies and invest in a more cost-effective future when it comes to farming. 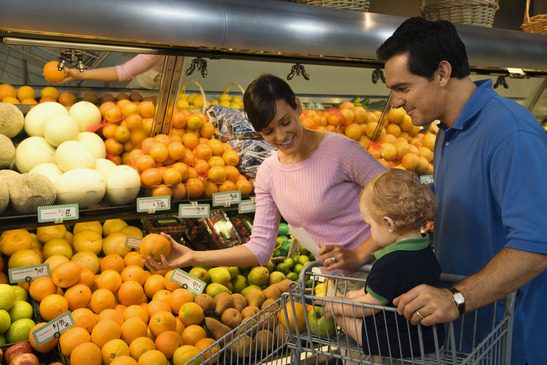 By setting a good example for our children with organic food, we pave the way for future generations. Our children and their children will lead healthier lives by reducing the amount of pesticides and hormones going into their bodies. They’ll also be able to drastically reduce the strain being put on our fragile planet by big commercial farms. In the end, going organic is healthier for planet Earth and the people who call it home.